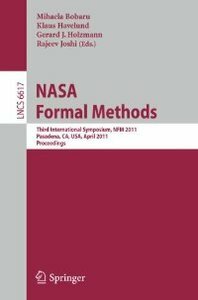 This book constitutes the refereed proceedings of the Third International Symposium on NASA Formal Methods, NFM 2011, held in Pasadena, CA, USA, in April 2011. The 26 revised full papers presented together with 12 tool papers, 3 invited talks, and 2 invited tutorials were carefully reviewed and selected from 141 submissions. The topics covered by NFM 2011 included but were not limited to: theorem proving, logic model checking, automated testing and simulation, model-based engineering, real-time and stochastic systems, SAT and SMT solvers, symbolic execution, abstraction and abstraction refinement, compositional verification techniques; static and dynamic analysis techniques, fault protection, cyber security, specification formalisms, requirements analysis, and applications of formal techniques.